★PREVENT DRIVING DISTRACTION – Tired of your smartphone always landing between the gap of your seat after a sharp turn? This is for YOU! 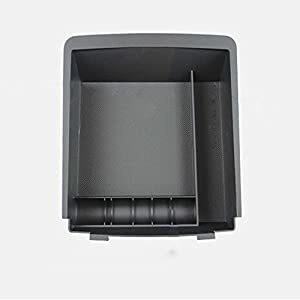 iSkyline car seat catcher will save you countless times from digging between the seat and center console to find your dropped cell phone, credit cards, money, keys, etc. This seat caddy catches items before it dropped between the gap. It also keeps your important things with reach and organizes your smartphones, keys, pen, coins, ipad and more. 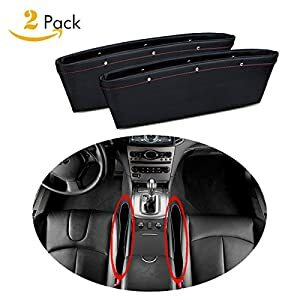 ★MATCHES THE COLOR OF YOUR CAR INTERIOR – iSkyline seat organizer comes in different colors you can choose from (black, beige and brown gray).The premium interior car accessories blends in with your luxurious car seat. 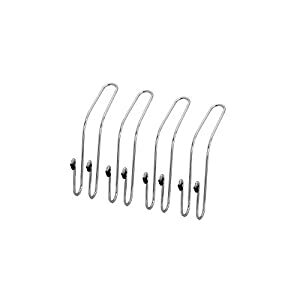 ★FITS MOST VEHICLES with gap size between 0.75 – 1.5 inches. The catch caddy dimension is 11.8 x 4.33 x 2 inches. Please check gap dimension to make sure there is still space for things to fit in. Electronics with Personality: Become a part of the tekbotic Collective, a collaborative community for modern technology lovers & users. We are a small team of young entrepreneurs-AKA fellow Humans-thoughtfully crafting Solutions that you Influence, and we Design. Multipurpose Cable Clips: Perfect for organizing cables at your desk, around your home, in the car, and at the office. Ideal for laptop chargers, USB / mouse cords, or even your earbuds. The possibilities are endless! Simple Install: Just peel and stick. 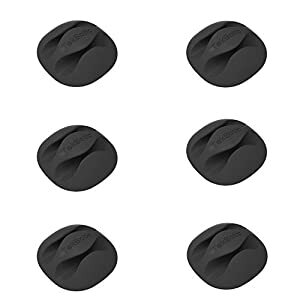 Our Cable Holder Clips, armed with a 3M adhesive backing which provides reinforced uniform contact, without the worry of damaging furniture or leaving a permanent residue. • CONVENIENT ORGANIZATION – A universal multipurpose backseat organizer. 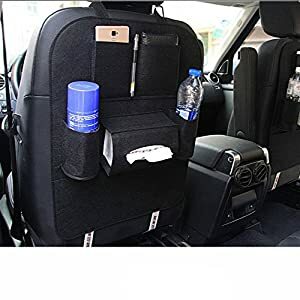 This auto backseat organizer is great to keep your car organizered, keep your seat clean and will protect your seat from getting scratched. It will cover your full seat. We offer best quality made to a very high standard. • LESS CLUTTER, LESS STRESS, MORE FUN – Keep your backseat clean and organized with the KIPTOP Back Seat Organizer and Bonus Kick Mat Seat Protector. With a superior build quality, numerous storage pockets of all shapes and sizes, iPad//tablet holder and folding meal frame – our KIPTOP Back Seat Organizer will revolutionize the travel experience of all passengers in your back seat. • STORAGE POCKETS FOR ALL – Whether it’s a baby rattle, a water bottle, a coloring book, or your toddler’s favorite stuffed animal, the KIPTOP Back Seat Organizer has a place for it. 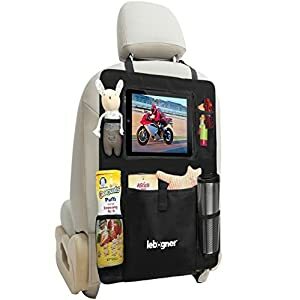 The Back Seat Organizer comes with large flat pockets for maps and coloring books, bottle holders for your favorite drinks, and a multi-purpose and a full length mesh storage pocket for snacks, toys, headphones, pens, crayons, wallet, phones. Normally delivered in 10 days.Amazon estimated delivery date is not accurate. Backseat Car Organizer + FREE Tire Pressure Gauge and an Ebook. GRAND OPENING: This Introductory Offer is for a Limited Time only. So take advantage of this price while it lasts. And also this is only a small sampling. 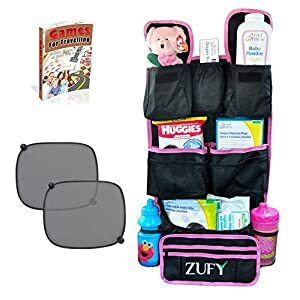 As parents, we understand the need of a Pink ZUFYTM backseat car organizer for our little girls and finally, here we are with a useful bundle with a FREE sun shades set and a ‘Travelling Games’ ebook. STAY ORGANIZED, NO MORE DISASTER ZONE : So many pouches that you will never run out of space. You will have spots for everything from kids and mommy essentials to even your fur babies. No more losing crayon in between the seats or on the floor. With see-through mesh pockets you can find what you are looking for faster. There is an EXTRA mesh pocket at the back wall of the car organizer to hide away any items that might need to be put behind. GREAT FOR ROAD TRIPS: No need to pack extra and carry a huge bag. You can keep your seat organizer always stocked with what you need. This back seat organizer will help condense your bag saving tons of room. Your kid will love to have some of their favorite car entertainment in front of them within their reach for longer car rides. 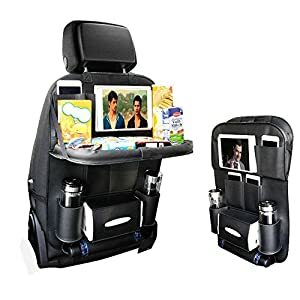 ✓ ★ A MUST HAVE ★ This BACKSEAT ORGANIZER + IPAD HOLDER is great to keep your car organized, Keep your seat clean and will protect your seat from getting scratched. It will cover your full seat. We offer Best Quality Made To A Very High Standard. ✓ Double layered fabric that will keep your Car Seats Clean even with the most active little feet in your car seat. And will instantly protect your upholstery or leather car seats from Scuff Marks, Moisture, and Dirty Footprints. 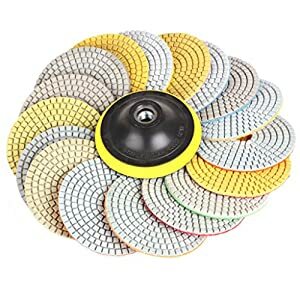 The Kick Mats are water resistant, machine washable, or easy wipes clean that will give your Kick Mats a Super Long Life and Always Look Good. 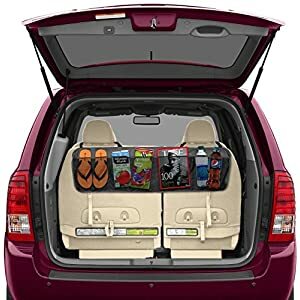 ✓ With large maximum full coverage designed Backseat Organizer, Kick Mats measuring 19″ wide x 27″ long (48cm x 68.5cm) it will cover and protect your whole seat with a snug fit, And will work with most vehicles seats. 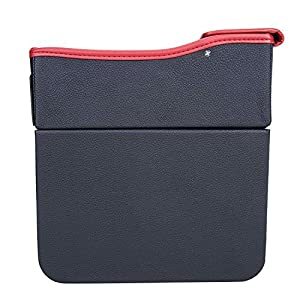 Includes 5 organizer pockets on the front for handy storage of food, kids play toys, colouring and reading books, baby gear and accessories, Also has a stylish high quality tablet holder that fits Android or iPad tablets. 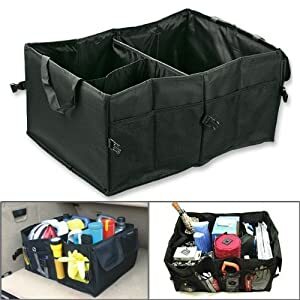 This BACKSEAT/TRUNK ORGANIZER Is Constructed Out Of Heavy Duty Material And Perfect For Cars, Vans, SUV, And Trucks. 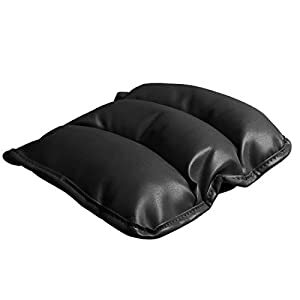 With It’s Premium Quality It Is Long Lasting, Strong, Durable, Good Looking And Will Have A Snug Fit Buy It Now With Confidence, This Best Will Keep Your Seats Clean 100% and We Guarantee Satisfaction With a 100% Lifetime Money Back Guarantee. The BackSeat/Trunk Organizer Is Measuring 41.5″ x 12″ (106cm x 31cm). 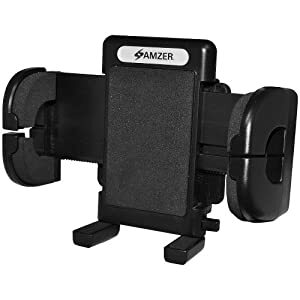 It’s Designed To Fit Most Vehicles With The Two Top Adjustable Straps For The Headrest Posts, So It Will Be Simple And Easy To Install On The Front Seat For Organizing Your Car, Or On The Back Seat For Organizing Your Trunk. You Can Store Sports Gear, Dog Supplies, Tools, Toys, And Emergency Equipment In The Organizer. It Will Keep The BackSeat Or Trunk Of Your Car Clutter Free. When Not In Use The Organizer Will Fold Flat For Easy Storage. Collapsible Folds Flat to half an inch for Easy storage when not in use. 3 Large sections for Organization/Storage; 4 Mesh pockets Located outer side. ✓ ★ A MUST HAVE ★ This CAR CONSOLE ORGANIZER Is Great To Keep Your Car Organized For An Enjoyable Ride. No More Leaving Your House Laden With Your Belongings, Place Everything You Will Need To Use Throughout The Day In Your Car Organizer. Easy And Convenient To Use. ✓ Make Fast Room For Front Seat Passengers While Keeping Driving Necessities Close At Hand And Clutter Under Control. The Car Organizer Is Measuring 13″ Long 10″ Wide 8″ High (33cm x 25cm x 20cm). It’s Made to A Very High Standard, Which Gives This Car Organizer A Good Look And A Super Long Life. When Not In Use The Organizer Will Fold Flat For Easy Storage. 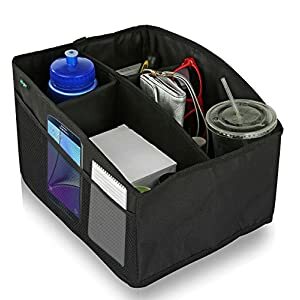 ✓ The Car Console Organizer Has 2 Big Storage Sections That Can Be Divided Into 4, It Also Has 6 Outside Mesh Pockets To Store Smaller Items, Also Has Inside Small Mesh Pockets For Pens And Other Small Items. The Pockets Are Sized To Fit Everything From iPads And Notebooks To Smartphones, Sunglasses, Tissues, Pens, Water Bottles and More. A Side Pocket with an additional Coin Pocket Coin & Smartphone & Wallet & Cards can be accommodated without hesitation. ✓ SIMPLY THE BEST & PERFECT SOLUTION to clutter and mess in your trunk rear or backseat, home, or garage! The Starling’s Eco-Friendly Cargo Storage Container expands up to 2 Feet Long with plenty of compartments to put your Car tools and Equipment, groceries, grocery bag, emergency tools, cleaning supplies, household belongings, etc. Cargo organizer tote, in car storage, truck bed storage. Best for SUV, Truck, Auto, Jeep and practically any Vehicle. 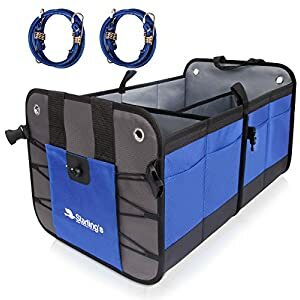 ✓ DURABLE & STRONG CONSTRUCTION – CUSTOMIZABLE CARGO COMPARTMENTS – Starling’s car organizer Made of Strong Durable 1680D Oxford Polyester with extra stitching and a solid 3-layer waterproof bottom board, this trunk carrier will last a long time with repeated use. Its dividers have Super Strong Polyester – covered cardboard sections that will not bend or collapse easily due to added weight. With its Innovative Design, the organizer stays firm and sturdy also without any cargo in it. ✓ PERFECT USABILITY – MULTIPURPOSE EXPANDABLE COLLAPSIBLE DESIGN – With two divided sections, you can use one or expand to use both. One side has two compartments to organize items while the other is a large open area. On the outside are 2 rubberized Non-Skid Bottom floor supports, 10 pockets, 1 pocket inside, 2 plastic buckles for closing, 2 buckles for locking half of the carrier, 4 eyelets, and 2 strong handles that will NEVER break. Collapsible design that folds flat to 1.5″ in any vehicle.